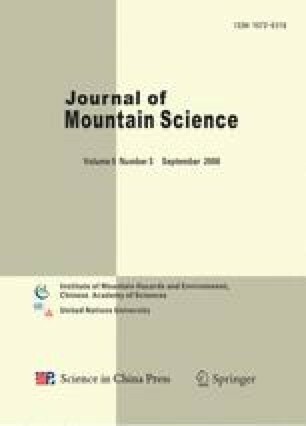 The process-oriented model Forest-DNDC describing biogeochemical cycling of C and N and GHGs (greenhouse gases) fluxes (CO2, NO and N2O) in forest ecosystems was applied to simulate carbon sequestration and GHGs emissions in Abies fabric forest of the Gongga Mountains at southeastern edge of the Tibetan Plateau. The results indicated that the simulated gross primary production (GPP) of Abies fabric forest was strongly affected by temperature. The annual total GPP was 24,245.3 kg C ha−1 yr−1 for 2005 and 26,318.8 kg C ha−1 yr−1 for 2006, respectively. The annual total net primary production (NPP) was 5,935.5 and 4,882.2 kg C ha−1 yr−1 for 2005 and 2006, and the annual total net ecosystem production (NEP) was 4,815.4 and 3,512.8 kg C ha−1 yr−1 for 2005 and 2006, respectively. The simulated seasonal variation in CO2 emissions generally followed the seasonal variations in temperature and precipitation. The annual total CO2 emissions were 3,109.0 and 4,821.0 kg C ha−1 yr−1 for 2005 and 2006, the simulated annual total N2O emissions from forest soil were 1.47 and 1.36 kg N ha−1 yr−1 for 2005 and 2006, and the annual total NO emissions were 0.09 and 0.12 kg N ha−1 yr−1 for 2005 and 2006, respectively.